We think of ourselves as matchmakers with (art) resources. After the first official Oxford Kinetics Festival (2011), the leadership of MAKETANK realized that if the OKF was going to truly grow, we would need to have programming that did not start to take place at the festival or a few weeks prior. We take inspiration from the great arts and innovation events in the United States (Baltimore Kinetic Sculpture Race, The Kinetic Grand Championship, the Burning Man Project, and the DaVinci Days festival), all of which have their contributors building, scheming, collaborating, and connecting year round to prepare for the few (relatively short) days of glory. We want that! We set out with a mandate--get people jazzed about the OKF, but also get them to commit to building innovative art and vehicles for it. We soon realized, however, that what we were doing was real, bonafide community building and it was stronger and better than a single day of grandeur. This is when the MTI year-round programming took on a life of its own. We foment creative, innovative, and unique opportunities for community members to connect, share skills, and become creatively confident. We use processes that stem from design thinking, appreciative inquiry, solution-based approaches, and non-linear thinking (thinking wrong). We eat and drink together at MAKETANK Projects and try to understand what they do. Somewhere in the discussion, dreams and needs come up--we take notes. We meet, and meet, and meet some more, always increasing the number of partners and resources as we brainstorm possibilities for creative and innovative solutions. We intentionally insert unusual prompts, foods, and activities to encourage partners to stray from the well worn path. Eventually we come up with projects that will be carried out by our new partners (these great people we have had the pleasure of working with), then the leadership of MAKETANK becomes project manager. An additional mission of MTI is to create opportunities for our fellow citizens who have limited creative opportunities. To accomplish this, we work with kids in grades K - 12. Their teachers and school administrators (from the Talawanda School District) have become some of our most important partners. Because of the momentum of STEM to STEAM (taking the science, technology, engineering, and math curricula to a more broadly engaging level through the introduction of the arts), the time is right for such programming. We are excited to have several educational projects that are in progress, and even more under development! We connected four senior students from the School of Engineering and Applied Science at Miami with 9th grade physical science teachers at Talawanda High School to address a curricular void dealing with force, motion, and acceleration. As their capstone project, the students created innovative teaching aids for the teachers, while being overseen by their Professor and the chair of Mechanical Engineering. The students first met with Talawanda teachers and then began designing a series of five curriculum modules (including lesson plans, projects and materials, powerpoints, and tests). These were delivered for use in the third quarter of the school year with their 254 students. Additionally, the engineering students created a culminating, hands-on project that tied together the concepts addressed in the first three of five modules. This will be introduced in the Fall of 2014 and will be brought to the Oxford Kinetics Festival where the students will compete against each other and share their work with the community. We worked with the Oxford branch manager of the Lane Library to develop a program for children that could tap into the resources and environment of the Oxford Kinetic Festival. The project features a reading list and associated program, and a participatory kinetic workshop presented by Crystal Clear Science, an experience involving hands-on learning. Crystal Clear Science will also make an encore performance at the 2014 Oxford Kinetics Festival. We connected a Theater and History major interested in education (guided by a colleague in Theater) and an art education major (guided by me) with the Big Brothers / Big Sisters of Butler County. This program launched in January of 2014 at Kramer Elementary in Oxford after school and continued every Monday up to the OKF. 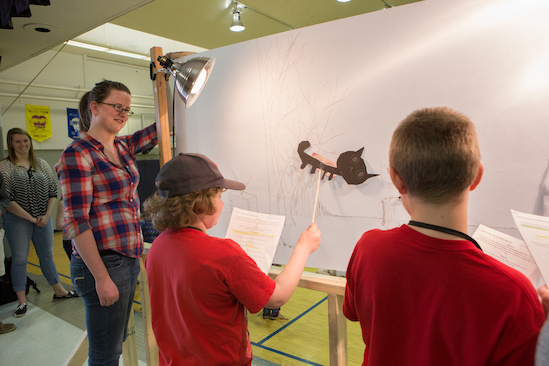 MAKETANK’s Kate Currie managed this project and helped them develop an original shadow puppet play based on a classic fairy tale. 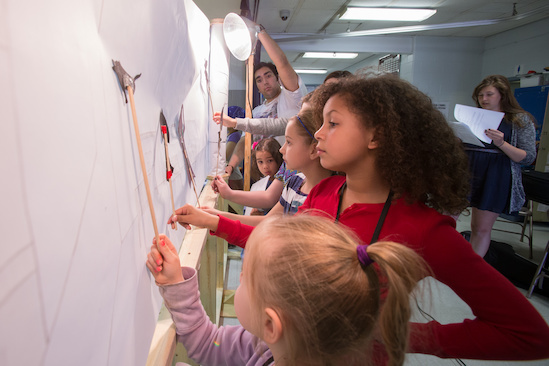 Students collaboratively wrote the script, designed and made the puppets, and ultimately performed the play at the Oxford Kinetics Festival on April 6th on an innovative, bike-powered, participatory stage which designed and built by two sculpture students. by 2015 we plan to launch the MAKETANK Mobile unit, a retrofitted airstream trailer that can take artistic participatory programming (such such as public garden building, shadow puppet theater, bike repair/modification, unplugged making) to isolated communities in the rural and urban areas of Southwest Ohio. MTI Year-round programming is growing in leaps and bounds, but there is always room for new proposals, fresh initiatives, unique collaborations, and creative connections. If you have ideas on how to make this a better connected, more confident, and progressively skilled community, or if you need more information, please visit the MAKETANK Inc. site.